Delicious Baked Spaghetti Casserole - spaghetti, egg, parmesan, cottage cheese, sausage/hamburger, crushed tomatoes, tomato paste, spices and mozzarella - SOOO good! Baked pasta topped with a quick homemade sauce. Makes a great freezer meal! 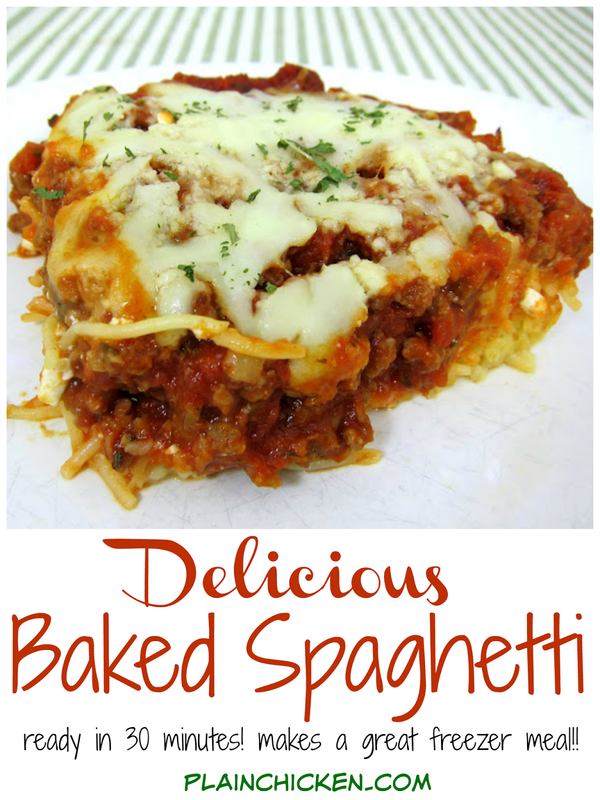 This Baked Spaghetti Casserole is SOOOO GOOD! Seriously! It might be my favorite baked spaghetti recipe on the blog. This was recommended by my parents. They ate it and just raved about it. We had to give it a try! This recipe makes enough for 6 people. I was skeptical because this was made in an 8x8 pan, but it was enough for 6 servings. We ate this for dinner and lunch the next day. I froze the last two pieces and we ate them on another night. It tasted great every time! Preheat oven to 350ºF. Lightly spray an 8x8 pan with cooking spray. Cook spaghetti according to package directions. Drain. Toss spaghetti with egg and parmesan cheese. Place in 8x8 pan. Spread cottage cheese over spaghetti mixture. Cook sausage, onion and garlic until sausage crumbles and is no longer pink. Drain. Add sausage back to skillet and stir in tomatoes, tomato paste, sugar and oregano. Cook until thoroughly heated. Spread over cottage cheese mixture. Top with mozzarella cheese. I love baked spaghetti and this one looks so good. Am anxious to try it. Thanks for sharing the recipe. N.
Thank you - looks and sound delish! It does look seriously good. Out tomorrow. Have a happy weekend. Yum, I love recipes like this, especially on the days I have to work. The flavors just get better and better. I just tried your baked cream cheese spaghetti the other night, and it was so good. I will have to try this one too! Do you use bulk Italian sausage or regular breakfast sausage? I'll be trying this out soon! My mom has been talking about baked spaghetti for like the last week haha, I'll pass it along to her as well! Jennifer - I just used regular breakfast sausage because that is what I had on hand. I think Italian Sausage would be delicious too! YUM! This looks like dinner tonight! Do you think subbing Ricotta Cheese instead of cottage cheese would work? I just can't bring myself to even look at cottage cheese - silly, I know! Vicky - ricotta would be a great substitute for the cottage cheese. If I made this and froze it, how long and at what temp would you recommend I cook it to heat it? Stacey - I would add about 10-15 minutes to the baking time and keep the temperature at 350. Thanks! Love your blog. These are my favorite recipes on Ziplist. Make this tonight, Ladies! I made it Saturday for dinner and it will knock your socks off. I did make it with Johnsonville Italian Sausage and both tomato products had Italian herbs and I substituted dried Italian seasoning for the plain Oregano. It is wonderful and your family will love it. Thank you Steph for such a good recipe. Tried this tonight and it was a big hit. A little spicey for me with the Italian sausage so will try half sausage and half lean ground beef next time but will definitely make again. Hi! This looks great...on the post it calls for a 14.5 oz. can of crushed tomatoes, but when I printed off the printable version it calls for a 14.5 oz. can of stewed tomatoes? Which one is it?? Thanks! I made this tonight and it was delicious, even my hard to please hubby liked it, and even better my 2 year old picky eater gobbled it up! I used Purdue brand Hot Italian Turkey Sausage (casings removed), low fat ricotta (not a cottage cheese fan), and whole wheat spaghetti. This will go in our regular rotation for sure! I've made this recipe twice lately and it is amazing! How do you think it would turn out if I put it in the crockpot for half a day, maybe 4 hours? Stephanie, I already have spaghetti and sauce made and mixed together from last night. Do you think if I reheated it and mixed in the egg, cottage cheese, etc. that it would turn out ok? Thanks!